A search for a missing cat in Mississippi led to a far scarier discovery -- an alligator in a storm drain. According to WLOX, the incident occurred on Tuesday in a quiet Pascagoula neighbourhood when Brooque Snow and her stepdaughter were out looking for their missing cat. "We looked inside (a storm drain) and there was an alligator," said Brooque Snow to WLOX. "At first were like wait a minute, so we took a second glance... then I took out my phone, took a picture and I told the neighbors." Ms Snow also called animal control officers, who arrived at the site quickly. 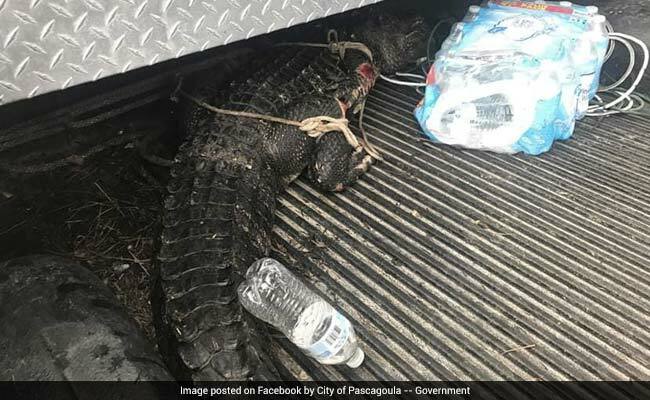 On seeing that the alligator was more than 4-feet long, they decided to call trappers from the Mississippi Department of Wildlife, Fisheries & Parks. A video of the trappers capturing the alligator was shared by a witness on Facebook, where it has collected over 77,000 views and hundreds of shocked comments. On their Facebook page, the City of Pascagoula -- Government also posted about the incident. "This 7 foot alligator was found inside of a storm drain on Columbus Drive this afternoon. Thank you to the family who called the proper authorities to safely remove the alligator," they wrote, sharing pictures of the gator. The alligator was captured and released into a nearby marsh.